There are those among the disaffected who would like to reap the benefits of the church as a community although they may no longer share the belief system that is the foundation of the church. For some, this works very well; for others, it’s an endless source of frustration. I recently read a great book called Connected: The Power of Social Networks that described how social networks work. As a result, I have drawn up 7 Rules (tips, really) for making church work as a social network. As a community, the church is like all other social networks; there are people you like, people you dismiss, people you trust, people who irritate you, and so forth. Ideas pass from person to person, both good ideas (healthy habits, positive attitudes) and bad ideas (unhealthy habits, negative attitudes). The benefits of belonging have a lot to do with the people who surround you. If the social contacts are beneficial, membership is valuable. If the social contacts are not beneficial, membership can be detrimental (this is one reason prisons are bad social networks if we hope to rehabilitate criminals). Dirty Little Secret: Not every social network is beneficial to every person. Rule #1: Recognize that it’s a social network. Choose to be in it. Social networks include strong connections (in Facebook, your “friends”) and weak connections (“your friends’ friends” and their friends). Strong connections create your social norms – they tend to be most influential on your idealogies, views and habits. But weak connections are also valuable – it’s how we typically meet our spouses or find a new job. Also, as information flows through our social network (via influential people), we can become susceptible to ideas and habits that originated through weak connections. Dirty Little Secret: People often take a passive stance with their relationships. They may not scrutinize the sources of information (norms) that come to them. Or they may not make good choices about strong vs. weak connections. Rule #2: Choose your strong relationships carefully (and be mindful of the influences of their strong relationships), and use your weak relationships to add to your network. According to the book, you accept new ideas from people in your network that you admire, people you view as successful or educated. The people who are influential to you are the ones you consider your closest “friends.” The people you influence are the ones who view you as their closest “friends.” Influence flows through social networks, from those perceived to be successful, educated, or wise to those who aspire to be like them. In an episode of Seinfeld, George laments that he doesn’t have “hand” in the relationship with his girlfriend. The one with “hand” is the one who is more influential on the other; the one without “hand” is the one who hopes to gain most from the association. The one with “hand” has all the power and can take the relationship or leave it. when “there are two spirits, one being more intelligent than the other; there shall be another more intelligent than they; I am the Lord thy God, I am more intelligent than they all.” So, influence flows from the most intelligent to less intelligent spirits. So God has the potential for the most influence among all intelligences. But if you don’t know God, you just have to deal with the smartest mortal people you can find, be they authors, spouses, family members, prophets, talk show hosts or drinking buddies. Dirty Little Secret: People sometimes think friendships are equal or that advice from friends is all good since they have your interests at heart. It’s not all good. Rule #3: Understand and define your position in your social network and in your relationships (who has “hand” with you; with whom do you have “hand”?). IOW, don’t take advice from stupid people or from people who are taking advice from stupid people. Ideas move from person to person through a social network. These might be useful, productive ideas (“smoking is bad for you,”) or bad, unproductive or unhealthy ideas (“fried food dipped in lard is delicious”). Likewise, within the church, various doctrinal interpretations operate like social epidemics. An interpretation is introduced by someone, and that idea spreads if people view it as 1) credible on its own merits, 2) coming from a reliable source, and 3) not contradicted by a better sourced, more convincing argument. BTW, rejecting bad ideas increases your influence over time as does embracing good ideas. Look at what has happened to smoker populations over the last 30 years for an example of this. Dirty Little Secret: You are always vulnerable to the ideas and social norms of your network, especially if you are unaware that you are. Rule #4: Pay attention to how ideas flow in your network; accept the best ideas from the best sources. Individual loners live in relative isolation or small family groups. Individuals learn that they can achieve more in collaboration. Some individuals in the system (free-loaders) decide they can reap the rewards of the group without participating. Some individuals resent the freeloaders and self-designate as punishers to control the behaviors that are counterproductive to the society’s greater good (at least in their view). What might these types look like in a church setting? Loners. These folks don’t really participate or interact much, so they are socially neutral. They may be peripherally associated with the ward (Jack Mormons) or they may attend regularly. They are more like visitors than members; they give nothing to and take nothing from the organization. Collaborators are the “norm” or the “majority.” These are your average people who try to help others, accept help from them, and wish the community well as an insider. They both give to and take from the organization. Freeloaders may be perpetual takers but not givers. This could be in the form of taking things like church welfare, member contributions of time to the organization, individual service from others, or spiritual edification without putting equal or greater amounts of the same (service, money, ideas, spirituality) back into the community over time. Punishers are out to define and protect the boundaries of the organization. They want to say who is in and who is out. If they are influential, they can convince others to “unfriend” you or to “friend” you. They want to punish and get rid of the free-loaders. Sometimes they go too far and start to “punish” those who aren’t free-loaders overall, but who are going through a rough period in which they need more than they can contribute. They may also target loners if they mis-assess them as free-loaders due to their low contribution. Dirty Little Secret: We need punishers like we need antibodies. But antibodies unchecked lead to excessive allergies, rejecting things that are not harmful or even that are good. Rule #5: Give as much or more than you get. Don’t freeload. Ignore punishers if you can, and stay the heck off their radar. If you get there somehow, make it clear you are not a freeloader. The book posits that “friending” God is actually an effective way to create a broader social network because suddenly all of humanity is the friend of a friend (other believers) or the friend of a friend of a friend (anyone who knows another believer). It all depends on who you consider to be “God’s friends,” which varies. Some Christians would say all Christians are “God’s friends,” (although many exclude the types of Christians they don’t like such as Mormons). IOW, belonging to a religion (friending God) does increase your social network instantly and substantially, and to some extent, you can define how it does that. Dirty Little Secret: God may not be a respecter of persons, but religious cultures are, and so is your social network. Rule #6: To maximize your religious social network, you have to friend God. This can be as simple as viewing everyone as connected and being filled with love toward all humanity. Friending God puts you in a theoretical sibling relationship with all of humanity. In reality, the connections created are mostly “weak” ones (not direct friends), but they do carry the social benefits of weak connections: links to 1) prospective spouses, 2) job opportunities, and 3) new ideas (good and bad) that pass through chains of influence to you. Likewise, “unfriending God” has some of the immediate disadvantages – you suddenly erase your weak connections, isolating yourself from those benefits of the community. Similarly, a relationship with God is like a relationship with anyone else, except that it’s even more one-sided and subject to personal interpretation (although all relationships are like this to an extent). Unfortunately, marriages sometimes fail when people mistake a weak connection (through their mutual “friend” God) for a strong connection. Strong connections take personal investment and time to develop. Dirty Little Secret: Strong connections require admiration and influence. And in a marriage, it has to be a two-way street. Rule #7: Bear in mind the difference between a strong tie to God (if you even have that) and a weak tie through God to another person. Building strong ties takes work. Marriages require strong ties with influence in both directions (not too much “hand” on one side or the other). Are any of these tips helpful to you? Do you disagree with any? How does the church work for you as a social network? Do these models help? Discuss. Just one thought regarding free-loaders and punishers. I am not sure I am clear about how the punishing of free-loaders serves as defining an organizations boundaries. They seem to separate things. If you get on the radar of a punisher, as you say, how can you convince them your not a free-loader, it would seem that trying to convince a punisher you are not what they think is a difficult thing to do. It would seem that relative to other people a free-loader is anyone who takes more than they give. This means that we are all probably free-loaders, even if we want to be collaborators. Moreover, I am not sure we are as able as this suggests to choose our influences in our networks so easily. As a ward in particular but also other factors like loneliness/family/work play a big role in selecting friendships. I know this is implicit in what you are saying but I wonder whether we actively accept other people because we have other constraints while having to actively abdicate to reject their ideas and influence. This becomes especially problematic if those same people do not have ‘hand’ in those relationships. # Punishers are out to define and protect the boundaries of the organization. They want to say who is in and who is out. If they are influential, they can convince others to “unfriend” you or to “friend” you. They want to punish and get rid of the free-loaders. * Sometimes they go too far and start to “punish” those who aren’t free-loaders overall, but who are going through a rough period in which they need more than they can contribute. * They may also target loners if they mis-assess them as free-loaders due to their low contribution. You realize that you’ve just described the hierarchy of the church, right? The guys who say who is in and who is out, and who have enough influence to convince even family members to “unfriend” someone who is different? And that plenty of us have been “punished” right out of the church, and are pretty damn justified in seeing the entire institution as one big punisher? And that the punishers’ aggression and intolerance has made the church allergic to lots of things that are good for it–including that triumvirate of enemies: feminists, homosexuals and so-called intellectuals…? I know this is just happens on a fundamental level of personal perception, and I have a different perception, but it pains me so much when the disaffected lump ALL members, the whole institution, into one category of the “punishers” or perpetrators of harm. Yes, I understand someone like me is in the same social network (the LDS Church), but there are so many of us working against that role. That all-or-nothing paradigm just kills me inside. Are you replying to me, BrianJ? Because I was not lumping “ALL members, the whole institution, into one category of the ‘punishers’ or perpetrators of harm.” That wasn’t my intent, and that wasn’t even what I said. I specified “the hierarchy of the church…. The guys who say who is in and who is out.” I’m talking about the men (and they are indeed men) who convene church courts, who correlate creativity out of existence, who tell us that when the prophet speaks, the thinking has been done and we should shut up. I think I’m pretty damn justified in calling those men punishers, and while I recognize that there are other types of people in the church, that doesn’t change the fact that the church has evolve into an institution that is run primarily by punishers (although I have it on good authority that there are some among even the quorum of the 12 who know that the church’s rigid homophobia and right-wing political stance is both immoral and injurious to the institution). If that all-or-nothing paradigm just kills you inside, think what statements like “the church is either true or it isn’t, the church is either the way to salvation or it isn’t” does to everyone who has doubts. What does THAT all-or-nothing paradigm do to you inside? Because it is explicitly promoted by the church, as an absolute tenet its “members” must accept. And if that’s not a punishing statement and situation, I don’t know what it is. Andrew S: If you break up with God, you get hand, but according to what happens to your social network as a result of that breakup, “you’re gonna need it.” What I think is most interesting about the idea of “friending God” is that it’s really creating a relationship based on whatever your notion of God is and then defining how that impacts others – are all humans one link away, or are some humans “closer to God,” and therefore stronger connections, in your opinion? And are there situations where your notion of God is deliberately exclusive of other people’s notions of God (e.g. Mormons worship a different Jesus)? Rico: “Moreover, I am not sure we are as able as this suggests to choose our influences in our networks so easily.” I think it is very hard to do. Most people don’t make a conscious effort to do so at all. It’s difficult to quit listening to bad (unsuccessful) advice from well-meaning people, especially if they like us, and we need to be liked. People are always getting talked into and out of things, and that has consequences in our lives. But if everyone did a good job discerning between people to listen to and people to ignore, natural selection would work, and those people with bad strategies would cease to exist over time. It does in fact work that way on the whole, just over centuries. Jason: I agree that punishers have a tendency to see harm where it is not, but I question your statement that the hierarchy are the punishers. I think there are some there as well, but the majority of punishers walk among us at the local level, tut-tutting over things they feel should not be allowed. The irony is that punishers (like overactive antibodies) relinquish being collaborators in order to pick up the banner and ferret out the “bad seeds.” But the majority of people in any community are collaborators. I wish I had something more to contribute to this than: interesting and insightful post. I think the parallels and differences “Real Life” social network and an online social network need further pondering/scrutiny. Very nicely done. Thank you for the thoughtful analysis. N – the book definitely goes more into this than what I have included here. Basically, what the authors found was that online networks are easier to map – you can literally trace the nature of relationships in a way that is less subjective for sociologists. For example, someone may report a close relationship with a person, but if you check their FB activity – you can see the relationship is one-sided or really more of an acquaintance than a friendship. The key difference noted by the book was that online networks change the historical geographical limitations that existed on connections. The world is truly more connected than it was 500 years ago, even though there were a lot fewer people then. Before the industrial revolution, people would be born, live and die, all within about a 100 mile (or usually less) radius. That limits your social network and the diversity of thought and experience you can encounter in ways we would find difficult to fathom. And our influences can come from further away and go to further away places than ever before. It seems you can analyze this seven ways to Sunday! I agree with much that Hawk has written. I find it a little disconcerting that in some ways the organizational church has moved members more to the “loner” status as the activities and social networking have been organizationally minimized. The family group is the basic unit of the Church and more time has been handled over to this group over the past 10 or so years. On the other hand, some people are just more social than others and can build their networks outside of the church construct. While they share the common beliefs, those beliefs as a prerequisite to the social network do not exist. Some folks are loners and do not interact well with others no matter what. But those are the extremes. Most of us fall in the middle somewhere. I can’t help but think many folks would not have reached disaffection if the Church’s official social network were more intact. Excellent post, Hawkgrrrl. This past year has taught me alot about social networking within the LDS church, both the good and the bad. Awesome post, Hakwergirl. It seems to me that there is a more important function for exclusion that does not appear to be included in the discussion. Let me illustrate it with a couple of real life cases. When the pope excommunicated Martin Luther, he was hardly getting rid of a free loader. Nor did Luther violate the norms of Roman Catholic theology or the Roman Catholic community. The problem was rather that Martin Luther understood theology only too well and that he was no longer willing to put up with the free loaders that happened to constitute the upper crust of the clergy. I suppose we can say the same about people like Lavina Anderson who had earned the wrath of Boyd Packer who couldn’t tolerate that Lavina was publishing the abuse of Mormon children at the hands of their bishops. Or, perhaps, it was her essay that documented the clerical pressure on historians, philosophers, and theologians for their scholarship. Either way, if you want to sustain hypocrisy, you better have the power to exclude the orthodox members of your group because otherwise, the days of your power will be numbered. #5 Jason, I’m not sure how you can label the whole institution as a punishment system and not splash ALL the members with that paint. “Because it is explicitly promoted by the church, as an absolute tenet its “members” must accept. Really? I don’t believe that, and I am a member in good standing. Maybe it isn’t so absolute, explicit and unanimous. It’s explicitly promoted by “punishers,” not by everyone in the Church. Punishers like to pretend they speak for everyone with a unanimous voice. They don’t. I have yet to find perfection anywhere on earth. So I have always found that idea to be full of fail wherever it is tried. It’s the quickest way to end up with a big fat pile of broken nothing. Various individuals by way of books and other mediums constantly strive to define, categorize, pigeon hole, classify, etc members of Jesus’s church as if it’s all about being some kind of a social psychological lab study. There are just two types of people in the church, in fact the whole world: those who need Jesus (the sick, the sinners) and those who don’t (the whole, the righteous). The medicine to cure the sick is simply ‘love’ as made manifest through empathetic acceptance and nurturing. The principal physician who administers these healing balms is the Savior Himself and/or through the healing powers of the Holy Spirit as well as certain others who qualify themselves as being bona fide ‘student doctors’ or ‘nurse practitioners’ to assist (but there are precious few of them around). As for the list: Loners, Collaborators, Freeloaders, and Punishers how come it doesn’t include the Destitute, the Mentally and Spiritually Affected, the Oddballs and other Outcasts? Are they not also to be numbered amongst the Savior’s chosen sheep who hear His voice and need His love? Do you really think the highest ‘heaven’ is going to be comprised of “Punishers?” and that even in the here now they serve a useful purpose to galvanize the members of the church to be “no more strangers and foreigners” and are purveyors of the Savior’s love? The Mormon church has failed many people. A ⅔ inactivity rate has to mean something, and from my personal experience it means that the hearts of many so-called active attending ‘givers’ are giving only to those whom they judge worthy as being recipients of their sincere sociality and love. And the Mormony, plastic smiles, glad handling and love bomb comments absolutely do not qualify as such. “…the church as a community” is a euphemistic fallacy for the truism: ‘exclusive church-club — membership subject to scrutiny; those with poor social skills, image and other deficiencies need not apply‘ Of course the church still wouldn’t mind putting you on its membership rolls because that makes it look like it is growing and thriving, but to be sure, don’t expect too much from it afterward unless assuming a role as an ignored wallflower is acceptable. Perhaps then, these should be on the ‘list’ as well: Ignored, or Marginalized, or Ostracized, or Shunned? In truth, the Kingdom of God that is within me and strives to work and redeem my wretched soul is often far more effective in granting me peace and hope than the social “the church…community” ever has. And that’s unfortunate indeed. There are just two types of people in the church, in fact the whole world: those who need Jesus (the sick, the sinners) and those who don’t (the whole, the righteous). There are two types of people in the world: those who divide people into two types, and those who don’t. Also, there are 10 types of people in the world: those who understand binary, and those who don’t. If you break up with God, you get hand, but according to what happens to your social network as a result of that breakup, “you’re gonna need it.” What I think is most interesting about the idea of “friending God” is that it’s really creating a relationship based on whatever your notion of God is and then defining how that impacts others – are all humans one link away, or are some humans “closer to God,” and therefore stronger connections, in your opinion? And are there situations where your notion of God is deliberately exclusive of other people’s notions of God (e.g. Mormons worship a different Jesus)? I think it’s like becoming a “fan” or joining a “group” on Facebook. You know how there sometimes are multiple groups for what essentially is the same thing? But because these are different groups, you don’t get connected to everyone…just the people in your group. Great post Hawk!! I thoroughly enjoy new ways of understanding my relationship with the church, as well as those in the community. Admittedly, for me, community is a very important aspect of the church. I think, however, I am really a mix of two types: a loner, and collaborator. Let me explain. I am a collaborator because I continue to serve in a calling, help people move, go to ward functions, and otherwise engage in service in the community. However, when it comes to actual meeting activity (that is, my level of involvement while I’m at church attending my meetings) I am most definitely a loner. Because my views vary wildly from the Mormon norm, I am usually quiet and disengaged, chiming in only when we stray too far into wild speculation. My point is, I think people could see me in either category. If all they ever see is me at church (don’t know what I do for my calling, don’t see me help others), they would likely view me as a loner since I don’t participate much. This is a great article. I think that if everyone would “friend God,” as you put it, the world would be a much greater place. If our country could just turn back to its roots of hard work, fearing God and respecting others, we could reverse a lot of the moral decay that is going on around us. I recently made the choice to officially rejoin the lds ranks after officially choosing to leave some years back. My whole perspective on faith and doctrine has changed and I return partially out of a desire for the social connections. It would be frustrating, indeed, if I didn’t recognize which connections matter most. When it comes what’s in my best interests I have to trust myself above anyone else. Punisher is not my personality. Freeloader just sounds wrong to me. I’m just not sure about Loner or Collaborator because I’m not sure it is my choice. In a prior ward…I was a strong Collaborator, and insider and very involved in the healthy giving and taking through strong connections. In my current ward…although I’ve tried with similar expectations…I just haven’t found strong connections. And I’ve put a lot of effort and waited a while for this to happen. So, I kind of head towards Loner, because I can’t expect to get back the same amount I feel I put in…and so I go to church and kinda hang in the back and read to myself. Hawk…the unique part of the church is it defines the social network for you geographically and then you’re stuck with that…as opposed to facebook or online groups where you can switch or go find the one that suits you best. “Hawk…the unique part of the church is it defines the social network for you geographically and then you’re stuck with that…as opposed to facebook or online groups where you can switch or go find the one that suits you best.” True. And of course, here we all are, creating our own virtual network in a way, perhaps to supplement. @Kuri: I didn’t divide people into two groups — Jesus in Mark 2:17 did. Or perhaps you have a more advanced understanding of the scriptures and I just totally missed the point and meaning of that particular verse. And by the way, if you are an active member of the LDS church, you just confirmed (again) my viewpoint in how cold, sarcastic, cutting, in-other-words, considerably bereft of love for their fellowman so many of the so-called ‘active saints’ are. Obviously (because of your put-down response to my attempt at contributing my sincere thoughts on the posted subject) you perceive something about me that you ‘just don’t like.’ And so, rather than try to come to an understanding and “reason together” and possibly even educate me, instead you are just another one those same ol’ – same ol’ members that draw lines in the church’s corridor carpet with the message, “stay away from me!” How pathetic I was to endure so many years of trying to make myself worthy of your acceptance, into your circle, of your love. The solace from my lassitude far away from the Mormon church was finally realized, freeing me to eventually find some hope in Christ’s pure love in other ways, with other people in other milieux. Thank you Lord Jesus. This is my witness and testimony. P.S. Sorry to write disparagingly about you, especially in a public forum, but perhaps it will do someone some good in realizing that the ‘list’ is incomplete. I have no disdain for you, Mormons, or whomever. You would always be welcome into my home. But I access the internet to learn not to necessarily socialize and thereby hopefully engage in edifying and benefiting exchanges. Sometimes that happens, too often, unfortunately, it doesn’t. There’s an old saying: As it is within, so it is without. When you are angry, you will find anger all around you. When you are laughing, you will find humor everywhere. When you love, you will find a world full of people to love, and the love will come back to you. Jesus taught me that a few years ago. He just asked me to share it with you. BTW, I’m not an “active saint.” I’m an atheist, if you’d prefer to toss about some generalizations about a group I actually belong to. I absolutely agree that people themselves, and their perceptions of other people, are sometimes their own worst enemy, although what Jesus may have asked you to share with me may conflict with what He has already confirmed to me in regards to the subject matter of this post. In any event the ‘old saying’ has its merits and I appreciate your attempts in contributing something that you may see as the fly in the ointment of my reasoning and comments. There’s no anger, although a sense of sadness that there are members of a chruch that purports to be Jesus’s one and only true church who think that “punishers” serve a useful purpose in it. This, and my opinion that the list should be expanded. Just my thoughts on the matter, and I can appreciate your understanding and desire to give me some constructive instruction, which you think I require. No harm in that at all, especially in the way you did it. @Kuri: Thanks for the update; its appreciated. It’s a sensitive subject with me (duh!) and I will readily admit that I could have misread your original reply to my post. Mea culpa. In any event, I have just read a wonderful essay on the subject and would be interested in your comments about it. It’s not on-line though, (only an excerpt). It’s in a book entitled: “The Cosmos in Becoming” and the essay I am referring to is the one by John F. Haught entitled: Is Nature All There Is. Im learning things I haven’t considered before. Paul B: I don’t know…I sure experienced something different when I lived in Provo for a couple of years. I went to the singles dances, firesides, and choir every week and was welcome even after I left the church, and even when I didn’t have my $4 to contribute to the refreshments and DJ at the dances. The singles crowd acts as a catch-all for those who happen to be unmarried and those who are pretty un-marriage-able. I found that it warmed my heart each week to see the kindness and inclusion shown to those without all their mental faculties, or those with serious social ineptness. In my branch where I live now, there are a few people with mental challenges that dominate Sunday School and RS, and they are shown a great deal of patience. I don’t doubt your experience in the slightest. I just have a different experience. I did wonder when reading this post, though, how people who can’t help but be “freeloaders” due to illness ought to handle themselves, according to the author that Hawkgirl is speaking of. Remove themselves? Sometimes the contributions people make are not easily visible. I often didn’t have $4 to my name, let alone enough to give that much to the singles dances. On the other hand, I danced with, listened to, and taught dance moves to a lot of lonely guys, helped clean up, played guitar and sang, started a lot of conversations with my unusual attire and dancing style, and contributed a professionally trained voice to the choir. Some would have me not show up if I didn’t have the money and didn’t intend to marry a Mormon, but others write me on Facebook to say the dances aren’t the same without me. Even if a freeloader is only giving people an opportunity to experience charity, I’m not sure it’s up to anybody but God to say if what they are giving is equal to what they are receiving. Are any of us really in a position to judge what someone else is capable of, or what intangibles they bring to a community? Amma the “hugging saint” will run after “difficult” people who try to leave the ashram and beg them to come back. She loves having people around who push everyone’s buttons, because by doing so, they are helping people grow in self-awareness and get closer to enlightenment. All that said, I do think a community needs to figure out how to set boundaries. The branch where I live now may all become enlightened through giving to the “difficult” people, but they may also burn out. @Ecumenigal: Well, you weren’t a ‘freeloader’ — you paid ‘in kind’ instead of with cash. And as King Benjamin said, “Are we not all beggars” anyway? A lot of times a ‘thick skin’ is required to survive in the church. However, I would submit that there are a lot of people who just do not have that quality and hence, what it takes to endure the regular societal processess that people normally have to go through in order to eventually fit in and cope. I would then further submit that it is for this reason, some of these types of people seek out a ‘chruch’ in order to be accepted. They have been led to believe that Jesus loves everyone, especially those who are not ‘whole’, and a ‘church’ is obviously a good place to find Jesus and His people. I think the full time missionaries, for the most part, do a good job in convincing people that the LDS church is the best place to find Jesus and His ‘loving’ people, as most everyone thinks that these young men are women are so pure and loving themselves, totally unlike some many other people in the cruel world. So they buy in to it only to discover that there is oft’times a huge difference between the attitudes of the missionaries and some notable members of the church, and so a lot of them leave, disheartened and disappointed. Of course not all wards and branches are like this, but from my experience there are a lot — too many. If you are visibly handicapped, however, either physically or mentally, or even if not overtly so, meaning that in many ways you’re still not playing with a full deck of cards, however you are ‘cute,’ likeable, or needy ‘in that way,’ then sure, LDSs and in fact I would think most members of any church or organization would be very tolerant and accommodating. However, it’s those who appear normal in every respect, but for certain reasons are not wanted or are ever fully accepted is where lies a lot of membership problems. There is also the factor of age and familiarity. For example, my wife and I are getting up there in age, but we are very young in spirit and just don’t fit in with a lot of the other ‘older,’ long-time members of the relatively new ward we are in. They have their long established friends and are quite content to maintain their status quo. We gave this ward five years of trying to ‘fit in’ and be considered ‘one of them,’ but eventually threw in the towel. Even having people over to the house and going out with them didn’t go anywhere. Now, we are much more content than before. We miss having a community, but at least we don’t come home from church disheartened anymore. We have other outlets now and are finding other people outside of the church to associate with. I even feel somewhat confident that we will find another established ‘community’ of some kind to socialize and worship. 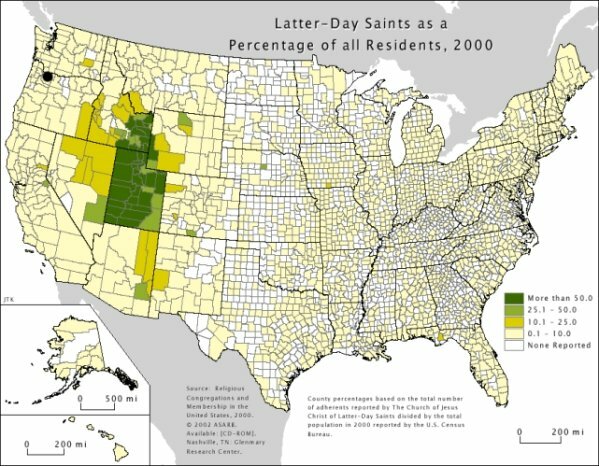 In short, I am coming to realize that the LDS church doesn’t work for everyone, and the more ‘in the box’ you are, the better. There’s a very big, diverse world beyond Mormonism. “There’s no anger, although a sense of sadness that there are members of a chruch that purports to be Jesus’s one and only true church who think that “punishers” serve a useful purpose in it.” Yes, humanity is what it is though. It’s just full of these kinds of disappointments. But I hear ya. @Hawkgrrrl: “But I hear ya.” But (and) you’re still talking to me. It was a strong comment that may have offended you, so thanks for your understanding. Like I said, it’s a touchy subject with me. A frustration for this member for at least twenty years, but now comfortable knowing how much I don’t know. Believing there could not have been a person without an organized universe, who then organized the universe, I can still interface socially with a good people – leading the music for many years – and other jobs not requiring such a “testimony.” I can feel gratitude for all the people who cared about our children as they grew up – and made life’s successes so much more likely than my wife and I could have made it alone. My having speaking assignments is a bit scary to some – the fear you know – that I might express gratitude for evolution, and other such miracles of our world.